Lot Detail - Human Volcano Sideshow Banner. Johnson, Fred. 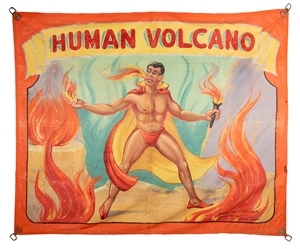 Human Volcano Sideshow Banner. Chicago, ca. 1960. Bright hand-painted banner depicts the fire king in loincloth and cape, flames leaping from his mouth and hands. 97 x 115”. Very good.